Employing only the best cleaning techniques, we also make sure to use green cleaning solutions that do not damage the surfaces in your house and provide your loved ones with a safe and clean environment. Additionally, our state-of-the-art vacuum backpacks have a built-in HEPA filtration system to protect you and your home from allergens hiding in your carpets and furniture. To make our services fit your specific schedule and needs, we offer flexible services, so you can choose which will work best for you and your family. The Maids signature 22-Step Deep Touch System was designed to combine strict attention to detail with our belief in safe cleaning for you and the environment. Kitchen, bathrooms, living room, and bedrooms will all get the most thorough attention, leaving dust and dirt no chance. 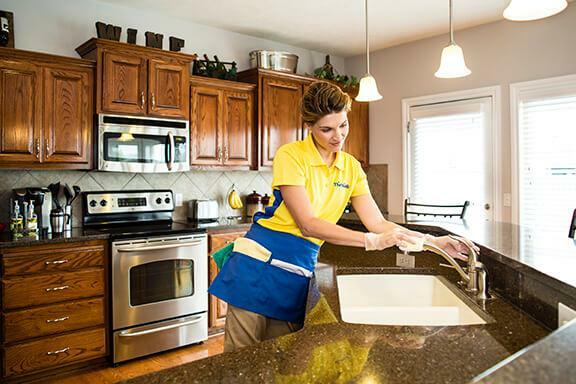 Depending on how busy your schedule is and what your needs are, we are happy to offer flexible cleaning schedules, including one-time, same day cleanings or housekeeping services on a regular basis. Sometimes circumstances demand that your house is clean… as soon as possible. Whether it is an unexpected visit from friends and family or any other reason – we know that getting everything done all by yourself is tough. Fear not! We will send a team of four cleaning fairies that will have your home squeaky clean in no time. Give us a call to schedule your same-day cleaning. Whether the move was planned ahead of time or is something completely unexpected, you can count on us to get your place ready to go. We will make sure that you don’t leave behind any dirt on the carpets, scuffs on the walls, grease in the kitchen, and mold in the bathroom. Needless to say, we will also clean your new residence to the highest standards if you are moving in. Carpet Cleaning is a beast of its own. No matter how careful you are with your carpets, they will accumulate dirt over time, harboring allergens and bacteria. Most vacuums on the market do not eliminate 100 percent of dirt. To make sure that even the smallest dirt particle gets removed, you need help from the professionals. This is where The Maids come in. Our carpet cleaning technicians use state-of-the-art machines that dispense a small amount of solution to the carpet to effectively clean not only the carpet surface, but deep in the pile, where hard-to-reach dirt and allergens are lurking. To make sure that your carpet is ready to use as quickly as possible, we use a special system that allows the carpets to dry within an hour and let you return back to your routine without any interruptions. With the weather conditions in Cleveland – frequent rain, storms and gusty winds – your widows may need some cleaning every once in a while, quite possibly more frequently than you want. Window cleaning takes time: washing the dirt off, removing finger prints, polishing the glass and making sure that no streaks are left behind. Now multiply that by the number of windows you have in your house and you will have a day-long exhausting project on your hands. Here, at the Maids Cleveland, we strongly believe that your personal time should be quality time with your family or friends. That’s why we will happily take the window cleaning off your hands. Our team of licensed, bonded and insured cleaning professionals will get the job done without interrupting your daily routines. Catch a Cavs game or go see the Browns, have a field trip to the Art Museum or indulge in fresh food at the West Side Market while we take care of your windows. Who knows, maybe you will also get a new outlook on life after that? Let us help you with starting fresh and cleaning your house. With our efficient systems, we will have your house ready for summer in no time. Windows, kitchen, baths, and bedrooms will all be squeaky clean and ready to shine. Since spring is also an allergy season, we will make sure to remove allergens from your home, such as dust and pollen that has accumulated on your carpets and furniture. Our signature backpack vacuums are equipped with HEPA filters, which allow us to get rid of as high as 99 percent of allergens lurking in your home. Why Choose The Maids Cleveland? Locally owned and operated, we are a part of a national network of world-class cleaning services. 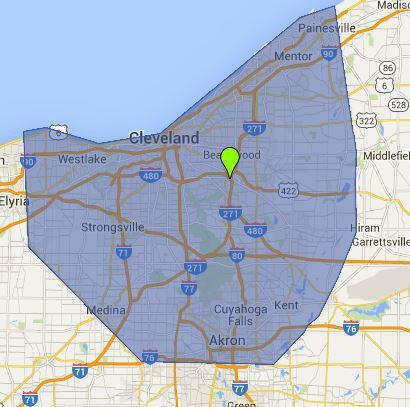 We are located in Cleveland and service multiple locations throughout Northeast Ohio – from Lakewood to Akron, Medina to Parma. 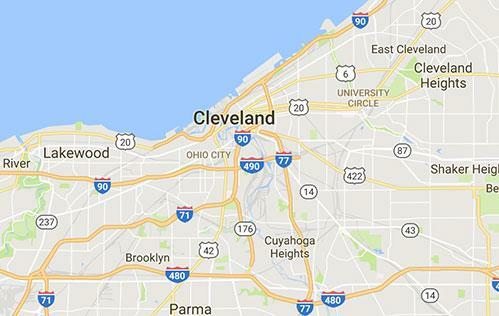 At the same time, we have access to a large network of cleaning franchises, attend annual conferences, and share our experiences, all to improve the services we provide to you and the local communities around Cleveland. Being part of a national franchise, we also have to adhere to the highest standards set by the corporate office. We screen, train, certify, bond, and insure our employees. This way, we ensure that your house is taken care of by the most skilled and reliable cleaners in the area. Whether you are looking to hire a cleaning service for the first time or are in need of a new provider, we will be happy to show you what The Maids’ excellence is all about! Schedule your cleaning appointment today.